The Equus 5000 Replacement Instrument Series 2 1/2 in. 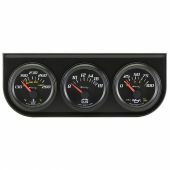 tachometer features a backlit white face with 270 degree sweep and red line indicator, chrome bezel, and pedestal mount. It is compatible with most conventional and electronic ignitions and a variety of cylinder configurations with direct and inductive pickup options included as standard. Compatible with 4, 6, and 8 cylinder engines with conventional and electronic ignition systems (2, 3, and 4 pulse per revolution signals). Can I use my 5076 with the inductive pick up clamp? Unfortunately the 5076 can only be used with our green wire that connects to the negative side of the ignition coil. This tachometer has a cylinder push button that allows it to be set from 4-6-8 cylinders.